In addition to his years writing and editing for the Seattle Weekly, Fred Moody is the author of books on Microsoft, virtual reality, and the Seattle Seahawks. His Fighting Chance: An NFL Season With the Seattle Seahawks details the team's 1988 season, from their drive to an American Football Conference division title to their eventual loss to Cincinnati. 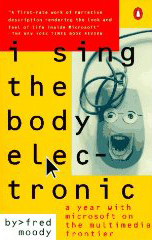 In Moody's next book, I Sing the Body Electronic: A Year With Microsoft on the Multimedia Frontier (1995) the author describes spending a year following around members of a Microsoft unit working on a children's multimedia reference product named Sendak. Having been given virtually unlimited access, Moody gives a week-by-week account of the tribulations of team members as they try to develop a viable product. Along the way he also shows the inner workings of Microsoft and the corporate politics and personality conflicts that are a part of every large company. 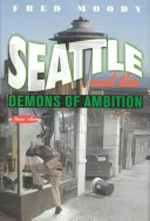 Moody's most recent book Seattle and the Demons of Ambition: A Love Story (2003) chronicles the transformation of the Northwest's signature city from a sleepy backwater, known mostly for its spectacular scenery and laid-back lifestyle, to an epicenter of the high-tech revolution.